A successful local moving experience requires good planning. From the very first phone call you make to Able Moving, until the completion of your local move, we leave nothing to chance; and we remain in close contact throughout the entire process. Our goal is to provide excellent, stress-free services at an affordable rate. From the free, no-obligation, in-home estimates, to pad wrapping all of your furniture before it leaves your home, our dependable local movers are trained to treat your belongings like their very own! After deciding you are ready to get an estimate, call Able Moving for an over-the-phone estimate — or schedule a no cost, no obligation in home estimate. The most accurate way to price your move is to have one of our professional estimators visit your home and gives you a detailed, accurate written estimate. Once you hire Able Moving for your move, you will be assigned to an in-house customer service representative (CSR). Your CSR will schedule your dates, answer any questions, and help you in any way up to and including on move day. Showing up on time, in a late model, clean moving van with a professional, uniformed crew is what Able Moving sells and what will be provided. The company goal is to come in at or under budget and exceed the customer’s expectation for all services provided. 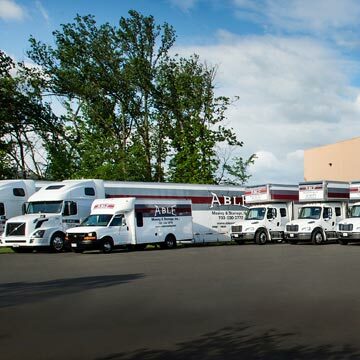 Whether it’s packing, crating, moving, and/or storage, Able aims to count on your referral when the job is finished. A successful move is our best advertising!